I believe that the workplace is our mission field and we need to listen to God’s plan to find the right mission field for each of us. Discerning My Calling is a complete career assessment package to guide your students into the future. If you are the parent of a high school student struggling to make the right choice for their future you are invited to discover how you can help your student find God’s plan in their life. “…you formed my inward parts; you knitted me together…” Scientist have proven this repeatedly with their discoveries. God has given us all a unique design from the moment of our conception. We have unique fingerprints, voice prints, retina scans, and DNA. 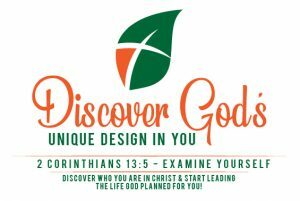 2 Corinthians 13:5 tells us to “Examine yourselves to see whether you are in the faith; test yourselves, that Jesus is within us – unless we fail to meet the test.” I invite you to take this opportunity to do just that during this workshop – Discovering God’s Unique Design in You.